The essential guide to the 2018 NFL and NCAA seasons. The most accurate team and player projections. Proprietary DVOA and DYAR ratings. In depth advanced statistics and intelligent analyses. The best annual guide to the 2018 NFL and college football seasons. The best annual guide to the 2018 NFL and NCAA football seasons. Paperback print version available through Amazon. Access to Sports Info Solutions game charting metrics, updated weekly throughout the 2018 season. 2015-2017 also included. 2018 KUBIAK fantasy football projections, customizable to fit the rules of your specific league. Weekly fantasy football player projections, powered by Sports Info Solutions data. Get one year of standard FO Premium access, including weekly picks against the spread, access to the Football Outsiders DVOA database (1989-2018), and the 24-hour fantasy football answering service. 400 pages of the best of Mike Tanier's writing at Football Outsiders, including updated All-Time Franchise Top Five QB and RB lists. eBook download available through Amazon. Bill Connelly's book on stats in college football, through the eyes of writers, coaches, and numbers geeks. The indispensable guide to injuries for anyone who watches, plays, or just loves sports. 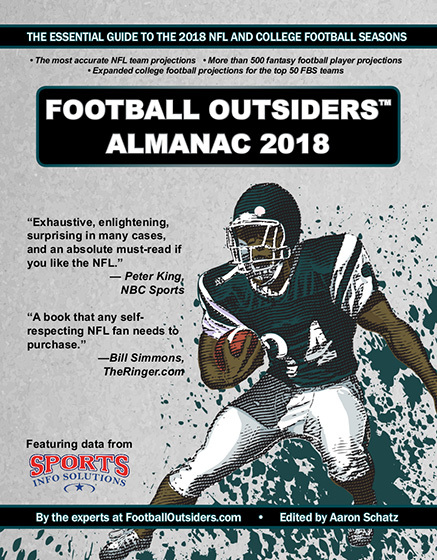 Go back in time with nine archived years of the Football Outsiders Almanac, from 2009 to 2017. How do I download my PDF Almanac or KUBIAK workbook? After your purchase, any files you have bought (FOA books in PDF form or the KUBIAK workbook) will be available by clicking on a button in the top left of the site that says MY FO DOWNLOADS. You can download multiple times if necessary (particularly with KUBIAK adjustments during preseason). How do I get my Premium access? After your purchase, use your account credentials to login on the upper left side of the page. This will automatically grant you access to the premium content. Direct links to the three Premium Access areas can be found here. Can I receive a printed copy of the FO Almanac with my package? Unfortunately, no. All packages which include the FO Almanac will be delivered by PDF download. Print and Kindle options must be purchased individually. No! The checkout process will guide you from FO directly to the PayPal website were you can make a single purchase without a PayPal account. Look for and select the prompt “Don’t Have a PayPal Account?” where you will complete a form and use your credit card information to complete the purchase. If you do have a PayPal account, you can use your login for your convenience. You will receive two e-mail receipt notifications: one from Football Outsiders and one from PayPal. Please note that it can take up to 30 minutes for your purchase to complete with PayPal. Please contact us if you have not received an e-mail notification after this time period. During higher volume times, PayPal will flag roughly 10 percent of all purchases for review. Rest assured they will clear, however, and you will still receive an e-mail receipt from PayPal to alert you to the availability of your product. How often is KUBIAK updated? Is KUBIAK updated during the regular season? Once training camps start, KUBIAK is updated periodically to adjust for the latest injuries and changes in depth charts until after final cuts in early September. You can keep track of these updates by looking for a box on the right side of the homepage titled KUBIAK UPDATES. KUBIAK is a preseason offering only. However, you can get weekly fantasy football projections all year long with the FO Weekly Fantasy product. It's just $30 for the year! More info here. What is required to use the KUBIAK workbook? The KUBIAK workbook is an Excel file with macros to sort values according to your league's rules. The workbook is only supported by Excel for Windows and Excel for Mac (2009 or newer). Is it possible to purchase Football Outsiders game charting data? Because of our partnership with Sports Info Solutions to provide our game charting data beginning in 2015, we no longer will be able to sell full spreadsheets of annual play-by-play and charting data. If you are still interested in purchasing this information, please contact Sports Info Solutions.